Lured by the American dream, non-immigrant workers here in the US have been subjected to different forms of exploitation, manipulation and abuse. The complexities of the recruitment process are being taken advantage of by placement agencies and sometimes with the collaboration of representatives of US employers. Oftentimes foreign workers leave their country deep in debt in raising money needed to cover for exorbitant placement and other fees. Recently, the US Department of Labor found Maryland’s Prince George’s County Public Schools in willful violation of the laws governing the H1B temporary foreign worker program. The DOL cited the school district’s failure to pay the proper wages by virtue of deduction of fees that are supposed to be shouldered by the employer as required by law and its failure to maintain complete documentation. The same decision also issues the following remedy as a penalty to the school district: (1) the school district is ordered to refund illegally collected fees to foreign teachers as back wages, and (2) debarring the school district for two years from participating in the H1B program. At face value it seems that this DOL decision is a victory to the foreign teachers who have been victims of illegal fees by their employers and also who have been the milking cow of placement agencies who practice shady recruitment schemes. The problem with the recent DOL decision however is that the debarment of PGCPS from the H1B program will mean not only that the district wouldn’t be able to bring in new foreign teachers but also prohibiting them from filing for the renewal of existing teachers whose H1B visas are set to expire in the next two years. Further the district is prohibited from filing permanent visa sponsorships to those teachers who intends to continue serving their respective schools and become permanent residents of the US. So in effect, this recent DOL decision will result in a series of termination of Filipino educators and other foreign teachers. Starting this month, more than 1,000 PGCPS teachers will be affected. In penalizing the school district, the DOL is in fact punishing the very victims of this illegal scheme by the employer and the recruitment agency. 1) The DOL decision does not embody justice but on contrary represents appalling injustice. It is a slap on the wrist of the violator and punishes hard the very people who were victimized and originally made the complaint. Also, we can’t help but wonder why the DOL is silent on the role of the placement agency that clearly has some violations and is equally responsible as well. 2) The decision would be a powerful disincentive to other non-immigrant workers in similar circumstances to report illegal recruitment activities by US-based employers and placement agencies. This will discourage other victims from cooperating with DOL and CIS investigations. Foreign workers should be encouraged, not discouraged from filing complaints. 3) The decision sets a bad precedent in cases of other Filipino and foreign teachers who have exposed the anomalies in the process by which they were recruited. One specific example is the struggle of Filipino teachers in Louisiana who stood up for their rights and recently have filed a class suit against their recruitment agency and the school district. And the DOL also have an ongoing investigation on the circumstance of their recruitment. 4) With this decision, the DOL is party to an unfair labor practice that is equivalent to retaliatory action against teachers and union members who initiated complaints against their employer. This kind of ruling would be welcomed by employers who aim to terminate those employees who stand up against them. 5) This decision is also damaging to the interest of the children of Prince George County. These highly qualified foreign teachers have performed well in their responsibility to educate the children of the district. These children deserve these commendable teachers and it is a disservice to have these educators terminated. It is with these points that the Partido ng Manggagawa is calling for the Department of Labor to retract its original decision and issue a ruling that is fair and just. We appeal to the Department of Labor to live up to its mission of promoting the welfare of working people. We also call on the Philippine Embassy to intervene with urgency on this matter. We are aware that the embassy in Washington DC is coordinating some efforts. However, with several of these teachers’ visas expiring within this month, there is a need for our embassy to pursue immediate and stronger action. We believe that our embassy consider a possible lodging of a diplomatic protest as this is a clear injustice to our citizens -- our teachers who came here to help fill in the teachers’ shortage, sold their properties and were victimized by illegal and exorbitant charges, worked hard to educating American children, only to be terminated by a violation that they did not commit. Lastly we call on all Filipino teachers of Prince George County to unite and move as one in pushing for your rights. The Filipino and the Filipino-American community are behind you. The workers movement is behind you. Stand up and let your voices be heard. It is imperative that you move together and you move now. 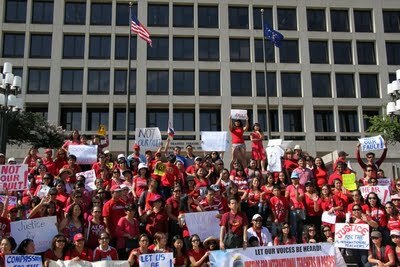 Long live the Filipino workers! Long live the Filipino teachers!